Stay up-to-date with what’s going on around campus. We’re putting on the ritz! Join us April 6 for a roaring good time! Did you know we have classes through eighth grade? Not familiar with the Montessori method? Providing exemplary private education in Houston, TX. Westside Montessori School has provided preschool, kindergarten, elementary school, and middle school programs for children aged 18 months through 14 years old for more than 40 years in the Energy Corridor of Houston, Texas. Our mission is to nurture and educate the young child while upholding the American Montessori Society principles and philosophies. Westside Montessori School is a non-profit organization, and our faculty is dedicated to the development of each child’s potential while maintaining and securing a beautifully prepared environment in which each child may grow and flourish. We are accepting enrollment applications for the 2019–2020 academic year and recently expanded our Middle School to include eighth grade. We invite you to join us for our open house on February 11, 2019, from 9:00 to 11:00 a.m. to learn more about why a Montessori education is a good fit for your child. 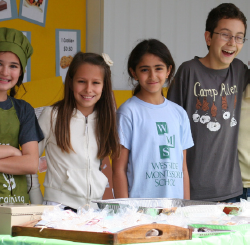 Please check out the Westside Montessori School newsletters for announcements and updates on school activities and events in our community. The Toddler Program is a prepared Montessori environment which provides for the physical, psychological and developmental needs of children under the age of three. 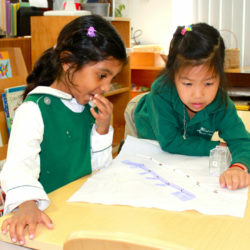 Our Montessori Early Childhood Program is based on the three-year cycle, with the third year serving as the culmination of the preparatory work during the first two years. Lessons given by trained Montessori teachers direct the children toward activities which help them to develop reasoning abilities and life skills in the Elementary Program. 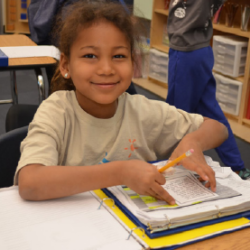 Montessori Middle School students engage in a rigorous course of study focused on experiential, research-based learning that fosters self and social growth.